The all-new RUF GT will also debut at the show. One of the star attractions at the 2017 Geneva Motor Show was all-new RUF CTR 2017, designed to celebrate the iconic Yellowbird’s 30th anniversary. While that car was a prototype, RUF will be presenting the final production version, now known as the RUF CTR Anniversary, at the 2019 Geneva Motor Show next month. The new model will mark the 80th anniversary since Alois Ruf Sr. founded the company in 1939 as a vehicle repair shop in Germany. While it may look like a vintage 1980s RUF CTR on the surface, the CTR Anniversary rides on RUF's new in-house developed chassis. It also happens to be the first carbon fiber monocoque chassis developed for a rear engine car. All of the body panels are also made of carbon fiber. Thanks to the extensive use of this lightweight material, the RUF CTR Anniversary weighs only 2,646 pounds. Like the original Yellowbird, RUF installs a heavily tuned twin-turbo 3.6-liter flat-six engine in the CTR Anniversary, which has been uprated to 700 horsepower allowing for a top speed of 224 mph. RUF claimed the prototype could hit 62 mph in less than 3.5 seconds and 124 mph in under nine seconds, so the production version should deliver similar performance. The first production example of the RUF CTR Anniversary will be delivered to its lucky owner during the Geneva Motor Show. Also debuting alongside the CTR Anniversary will be the all-new RUF GT. 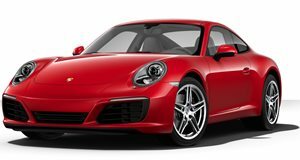 Based on the previous 991-generation Porsche 911, it boasts a 3.0-liter flat-six that produces 515 hp and 476 lb-ft of torque mated to a seven-speed dual-clutch gearbox. With this setup, 0-62 mph takes 3.4 seconds, while a ducktail spoiler generates high downforce to keep the RUF GT stable at its top speed of 199 mph.